“No”, of course not. Instead why not pause for a minute and listen to the message your body is trying to send you, rather than automatically reaching for the painkillers? While it’s easy to forget, the human body is incredibly intelligent. It handles millions of different functions each day – many at the same time – and has incredible healing abilities. However, as most of this happens without us ever being aware of it, it’s all too easy to take this for granted until something goes “wrong.” Pain is experienced or unwanted symptoms appear. Sadly, the usual response to this is to want to remove the pain or unwanted symptoms NOW, if not sooner. And, preferably, without any changes being made to how we live our lives. What we’re doing or how we’re doing it. Unfortunately, by adopting this approach, we’re missing out on a golden opportunity. The body may be sending a message we don’t want to hear, but it’s still one we need to listen to. Warning us to stop what we’re doing – perhaps the lifestyle choices we’re making – and take conscious remedial action before any damage / further damage is done. And this applies regardless of the type or intensity of the pain being experienced. Pain tends to be split into two broad groups. Short lived acute pain and ongoing chronic pain. Acute pain may last for a moment – the “ouch” when you stub your toe – or continue for longer periods. Be mild or excruciating. Last for weeks or months. The examples usually given for acute pain are accidents or injuries, where the pain is sudden and unexpected, but relatively short lived. The message is always the same. STOP whatever you’re doing RIGHT NOW and KEEP STILL to prevent any further damage. Broken bones, muscle damage and other trauma. Often it’s accompanied by inflammation to immobilise and protect the area from further damage. 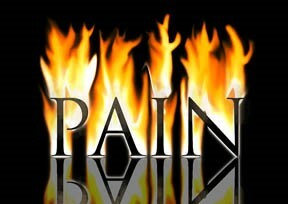 Acute pain may start at a lower level and then build up over a period of time if nothing is done to help alleviate it. Headaches or migraines. It disappears when the underlying cause has been treated or the body healed. Generally, it’s said to last less than six months, although it can lead on to chronic pain if this doesn’t occur. Chronic pain occurs over the longer term – or on an ongoing basis – and may be mild or severe. It may be linked to an unresolved injury, damage or an ongoing disease process. Poorly healed fractures or torn muscles. Arthritis, cancer, osteoporosis, diabetes. While it may be easier to hear the message acute pain is telling you – and instinctively follow it – all pain offers the same opportunity if we’re prepared to listen to what our body is trying to tell us. The sudden jab of tooth pain, warning us that eating sweet or acidic foods is making it worse. And the need for a check up at the dentist. The dull ache of a headache, reminding us that we’re dehydrated and toxic, so need to drink some water. The build up of a Migraine which, again, may be reminding us that we’re dehydrated or, perhaps, stressed or have eaten the wrong foods. Pain can build up over a period of time if we fail to take the body’s initial hint that action is needed. A gentle prod becomes a poke in the ribs, as our body tries to get our attention. A niggle become screaming pain, with teeth problems being a classic example of this. The message of chronic pain is no different, although action will be required over a longer period or ongoing basis. Simple changes can make a huge difference both in managing – or eliminating – pain, as well as making you feel more in control of your life. And these are the things we mention regularly in this blog. Gentle exercise, relaxation techniques / meditation, drinking water, reducing sugar and other acidic foods and supplements. Hands on treatments such as acupuncture, massage or gentle manipulation. By adopting this two pronged approach, the underlying cause can be addressed while painkillers are used, as necessary, to maintain a good quality of life. The alternative hardly bears thinking about. Becoming dependant on increasingly higher doses of painkillers, while feeling less and less in control of your life. Although using over the counter painkillers may not seem like a problem, they are the top of a potentially steep and slippery slope. From here it’s all too easy to fall into the trap of seeking “a little pill” for every little symptom that appears in your life. And, before we close, let’s not forget that physical pain isn’t the only type of pain we can experience. Exactly the same comments apply to mental or emotional pain. Grief, depression, trauma, anxiety. While the medications may differ, it’s all too easy to find yourself on the same slippery slope. Too often clients come to us having taken medication for depression or anxiety for years – with many saying that they don’t feel any better for it – and finding it virtually impossible to cut them down. In many cases the symptoms they’re experiencing are worse than those that originally led them to seek help in the first place. And yet there are so many other things that could have helped them, had they been encouraged to listen to what their body was trying to tell them at the time. The good news is that it’s never too late to make changes, it may just take a little longer to start feeling an improvement.